Pernicious anemia is an autoimmune illness whose symptoms are identical to those found in the description of Dracula in Bram Stoker’s novel. (By the way, Dracula was considered to be “Oriental” because Transylvania was the beginning of the Orient.) These symptoms include white skin (lack of red blood cells); sleeping all day; sore tongue, which prevents the eating of solid or spicy food; loss of appetite; a craving for rare meat; and bad breath. Today, people with pernicious anemia inject vitamin B12 once a month to aid in blood making. Before World War II, one had to eat raw liver to survive! 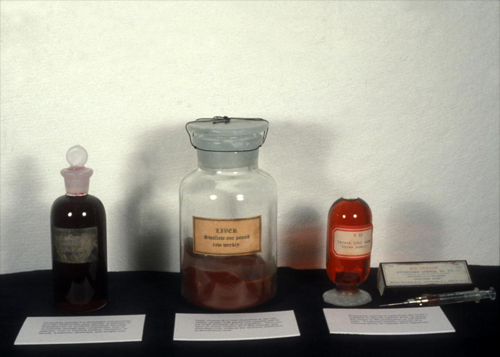 Before the discovery of the raw liver cure, blood might have been prescribed.